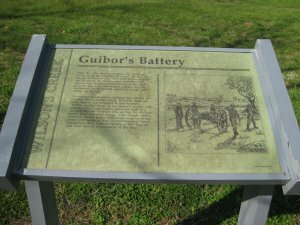 Location: Guibor's Battery is located at the WCNB Tour Stop 6 [ Waypoint = N37 06.110 W93 24.905 ]. 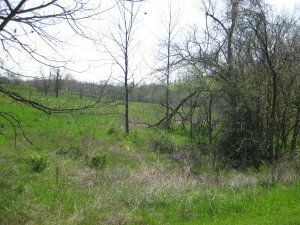 If you are traveling by car from WCNB Tour Stop 5 [ Waypoint = N37 05.735 W93 24.589 ], you will pass, on the right, the wooded ravine [ Waypoint = N37 05.893 W93 24.724 ] used by the Confederates for their approach up Bloody Hill. It is about 0.2 miles along the tour loop road from tour stop 5. If you are feeling adventurous and want an experience similar to that of the Confederate soldiers, begin at the Wire Road on the north side of Skegg's Branch [ Waypoint = N37 05.819 W93 24.504 ]. 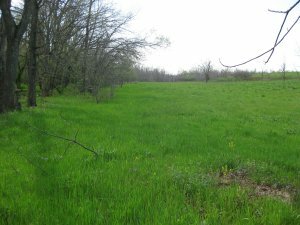 Follow along the north bank of Skegg's Branch for about 0.25 miles until you hit the wooded ravine [ Waypoint = N37 05.893 W93 24.724 ]. Then follow the ravine up the hill another 0.25 miles or so until you reach Guibor's Battery [ Waypoint = N37 06.110 W93 24.905 ]. Description: Captain Henry Guibor and his four gun Missouri Light Battery began the morning of August 10th camped on the Edwards Farm. But after the fighting started, Guibor's Battery quickly got into position at this location and began firing on the Federal positions up on Bloody Hill. 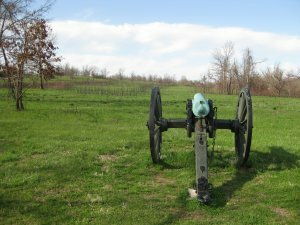 It was the artillery fire from Guibor's Battery that caused Totten's Battery to cease its duel with the Pulaski Light Battery in the east and turn its attention to the south.